This seems highly unlikely, given that the U.S. is one of its largest cash-paying customers. China is PdVSA's largest customer in Asia, but it doesn't receive payment for these shipments - it is using crude to pay off its vast debts instead. 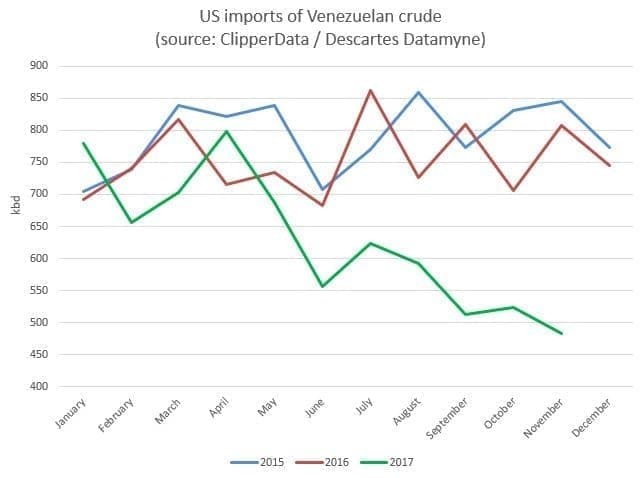 We can see in our ClipperData that U.S. imports of Venezuelan crude have been exceedingly steady in recent years, averaging 773,000 bpd in 2014, 792,000 bpd in 2015 and 754,000 bpd in 2016. 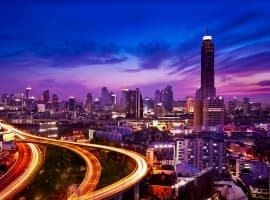 Steady flows make sense - not only because of the presence of Citgo refineries on the US Gulf Coast, but because Gulf Coast refiners are geared towards refining the heavy crude that Venezuela produces. Proximity is also a key consideration. Exports this year, however, have dropped considerably, nearly 20 percent below the 3-year average to 629,000 bpd. After a fairly regular first five months of the year, imports have taken a dive since, dropping below 500,000 bpd in November. This is a result of falling Venezuelan production, which has now dropped below 2 million barrels per day, a near three decade low. 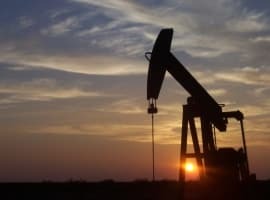 It also because U.S. refiners such as PBF Energy have halted buying from the state-run oil company due to both crude quality and credit issues. 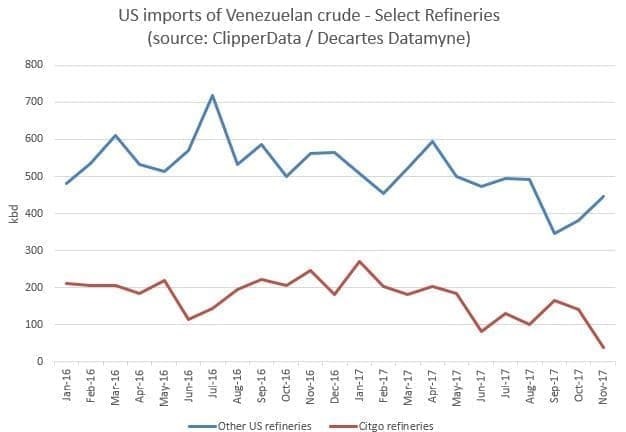 As U.S. imports of Venezuelan crude continue to fall, PdVSA is making sure to send product to as many of its suppliers as possible, at the expense of its own refineries. Deliveries to Citgo's two refineries at Lake Charles and Corpus Christi have dropped to just 38,000 bpd in November, the lowest on our records, after averaging just over 200,000 bpd in each of the last three years. Venezuela and Curacao import light crude and naphtha to use as a diluent, mixing it with its heavy crude for exportation. 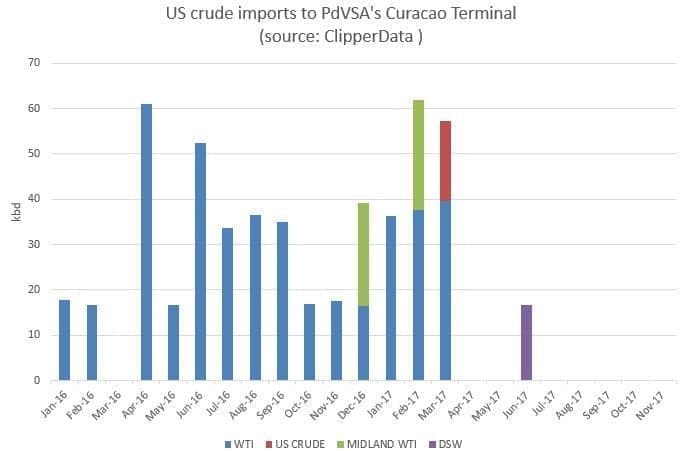 After importing other grades in previous years, PdVSA's Curacao terminal started regularly importing U.S. crude at the start of last year. It imported (mostly) WTI in every month but one last year, with deliveries averaging 29,000 bpd across the period. But after a solid start to 2017, imports started to sputter in Q2. After an absence of deliveries in both April and May, there was a 500,000 bbl delivery of DSW from Enterprise's Beaumont terminal. This was the last delivery of U.S. crude in the last five months. Last week we told clients about the Aframax Tulip. 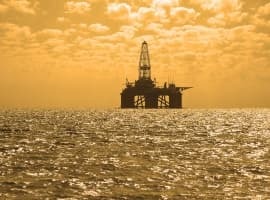 It left Enterprise's Beaumont terminal with 500,000 bbls of WTI in mid-May, and has been anchored off Curacao ever since. After waiting there for six months, the vessel left her anchorage last week. It would appear that the owner of the cargo has given up hope that PdDVSA will ever pay for the oil. That's major news, that's 2 million bbl per day out of the us storage tanks. They may need to open up the SPR to ease the crunch. I doubt he's bluffing, it was probably in the fine print with the loan from the Kremlin. Why doesn't the US ask Venezuela if it wants to become a US state. They'd be a lot farther ahead and it's evident they can't obtain wealth on their own. Like Puerto Rico, maybe ?